You are looking for a magnetic key safe. This is a special church picked to celebrate that the Church Micro Series has now got to 7500 caches! Many thanks to Sadexploration for starting this series and reserving this number for this amazing church. The Abbey Church of Saint Peter and Saint Paul, Bath, is commonly known as Bath Abbey, is an Anglican Church and a former Benedictine monastery. 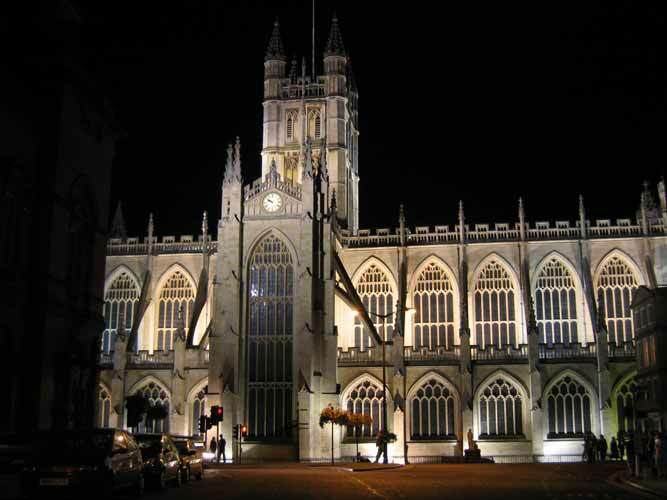 Founded in the 7th century, Bath Abbey was reorganised in the 10th century and rebuilt in the 12th and 16th centuries; major restoration work was carried out in the 1860s. It is one of the largest examples of Perpendicular Gothic Architecture in the West Country. The church is able to seat 1200. An active place of worship, with hundreds of congregation members and hundreds of thousands of visitors each year, it is used for religious services, secular civic ceremonies, concerts and lectures. The choir performs in the abbey and elsewhere. There is a heritage museum in the vaults. Above: the main aisle; the stained windows and the north organ. The abbey is a Grade I listed building particularly noted for its fan vaulting. Designed by William Vertue, who designed similar vaulting for the Henry VII chapel, at Westminster Abbey. It contains war memorials for the local population and monuments to several notable people, in the form of wall and floor plaques and commemorative stained glass. The church has two organs and a peal of ten bells. The west front includes sculptures of angels climbing to heaven on two stone ladders. Above: the fan vaulting; a memorial; the main entrance. The Bath Abbey Heritage Vaults Museum is located in the restored 18th-century cellars, and features artifacts and exhibits about the abbey's history. Displays include the different buildings on the site and their uses, the abbey's impact on the community, the construction, architecture and sculptures of the buildings, artifacts and sculptures, and the role of the abbey in present times. Stage 1 - you'll find fountain in the middle of the pavement A is the number of letters in the first word of the engraving on the fountain "____ is best"
Stage 2 - You'll find a brown sign behind the railings BC is the number of meters East where the Apse is believed to have extended until. “If anybody would like to expand this series please do, I would just ask that you could let Sadexploration know first at churchmicro@gmail.com so he can keep track of the Church numbers and names to avoid duplication. Ng Tm lbh'yy frr gjb vgrzf gel gur bar ba gur evtug.